The new GARDENA Outdoor Handy Vac EasyClean Li is your solution for cleaning outdoor areas. It can pick up fine particles such as pollen or dust as easily as moist soil, making it a true multi-talent for the garden, yard and for hobby gardeners. Every home needs a good handheld vacuum cleaner, but these are usually limited to indoor use. 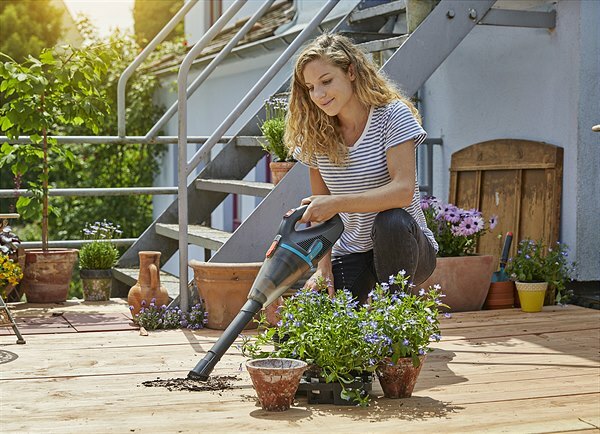 From 2019, the new GARDENA Outdoor EasyClean Li Handheld Vacuum Cleaner will offer a solution that can be used outdoor areas too — easy-to-use, compact and with substantial suction power. After a storm, during the flowering season or in autumn when the leaves fall, hobby gardeners constantly reach for brushes and cloths in an effort to keep their outdoor areas clean. Paths need to be cleaned, as well as garden furniture, balconies and terraces. With the new GARDENA Outdoor EasyClean Li, this can now be done in no time at all. This cordless Handheld Vacuum Cleaner for indoor and outdoor use is a real all-rounder, as it can pick up both wet and dry particles, meaning it can be used almost anywhere for any task. From stray soil after repotting, loose leaves, a grit spillage in the garage due to a split bag, or even if your car boot needs a quick clean — the GARDENA EasyClean Li is always on hand to quickly solve your problem. The powerful built-in rechargeable battery has enough power to pick up larger dirt particles and moist soil. A filter guarantees efficient suction power, even for fine particles such as dust or crumbs. Thorough cleaning in outdoor areas is made even easier by the various attachment nozzles and brushes, and the handy wall bracket doubles as a charging station, meaning that the compact vacuum cleaner can be conveniently stored in your shed or garage and is always ready for use whenever you need it — be it for a car or a motorhome.